In this article we’ll cover the steps of creating an automation from scratch. 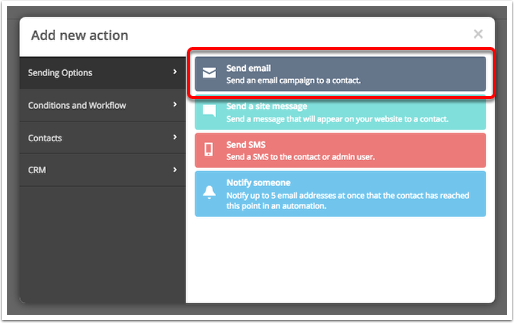 In this example, we'll show you how to build an automation that delivers a welcome email after a contact joins a list and tags the contact based on how they interacted with your email. These tags are useful for beginning (or ending) other automations, creating segments of contacts, and gathering analytics. 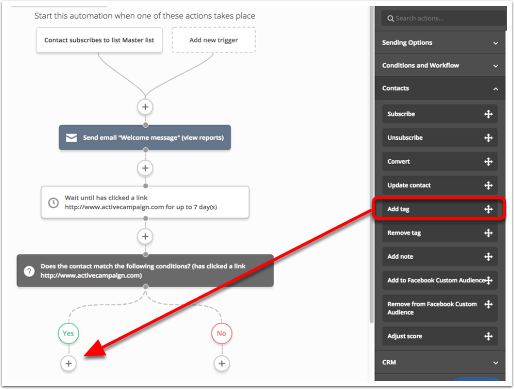 This is a good article to read if you are new to marketing automation: we've made it as detailed as possible and explained why we're suggesting the steps below so that you can understand how to combine various triggers, actions, and logic to create automated workflows. 1. Click "Automations" to navigate to the Automations overview page. 2. Click “New Automation” to display the automation menu modal. 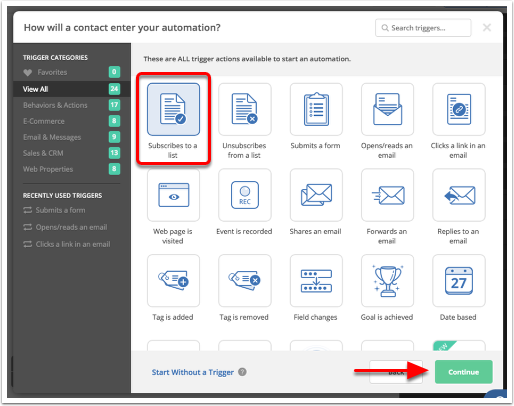 We could begin this sequence a number of ways, but in this example, we'll show you how to begin this automation whenever anyone is added to a list. 1. Click the “Subscribes to a list” trigger, then click "Continue." 2. Next, choose the list from the dropdown that will begin the automation. In this example, we're going to choose "Master List." Since we might be using multiple forms that add people to the Master List, it makes sense to start this automation whenever anyone is added to this list, rather than having a different trigger for each form. “Runs once” means that a contact will only enter your automation once through a specific trigger no matter how many times they meet the triggering conditions. “Runs multiple times” means that a contact will enter your automation through a specific trigger each time they meet the triggering conditions. 4. To finish configuring this trigger, click "Add Start." It's best practice to send a Welcome email to a new contact immediately after they opt in to your list. Welcome emails tend to have some of the highest open and click-through rates, so this is a chance to get important messages in front of your contact and present important calls to action. 1. Click the "Send Email" action contained in the "Add New Action" modal. This modal will appear as soon as we finish configuring our "Subscribes to list" start trigger. 2. Click the "create an email" link. 4. 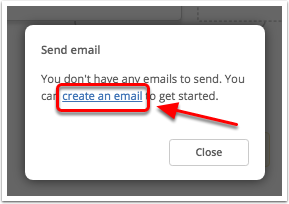 Next, type the name of the email into the field provided then click the "Create" button. This email name is internal; contacts will not see it. We recommend using a descriptive name that will remind you of the email's purpose. In this example, we're going to name this email "Welcome message." Note that you will be able to give the email a subject line (that your contacts will see) later on. 3. You will then be directed to the "Templates" page where you can select a designer template for your message. Note the "Build from Scratch" option: you can use this if you have an HTML template you would like to use, or if you want to send a "Text only" email message. In the example below, we're going to use the "Personal Email" template. This template is a text-oriented email, so we'll have ample space for marketing messages, and it has the feel of a one-to-one email which is appropriate for a welcome message coming from a specific person on your team, such as the CEO. When you find the template that suits your purposes, mouse over it and click "Use this design." 4. You’ll be presented with a modal that gives you the option to modify the sender information and create a subject line for your email. These options can be accessed and edited later, so what you create at this step is not set in stone. Once you've modified the sender information and added a subject line, click "Continue." The email designer is fairly straightforward and intuitive. Your email is divided into blocks which can be dragged and dropped. To add a block, you click and drag it from the sidebar and release it when the desired position is highlighted. To remove a block, mouse over it and click the gear icon, then click "Delete this." When you click into a block, you’ll see a variety of formatting options appear both above it and in the right-hand sidebar. Different types of blocks have different options so spend some time exploring each block and the options available to you. After you’ve customized the text and formatted the email, click the “Next” button in the upper right-hand corner of the screen. You’ll be redirected to the “Campaign Summary” page. 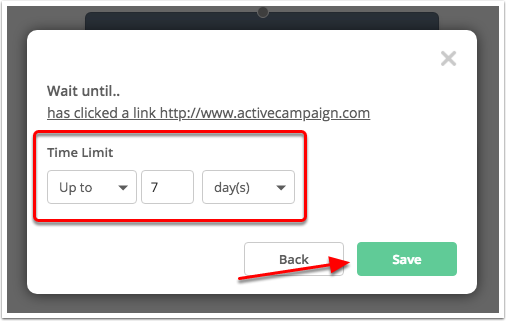 If you placed any kind of call-to-action in your email, turn on “Reply tracking.” To do so, click the the toggle to its "On" position. 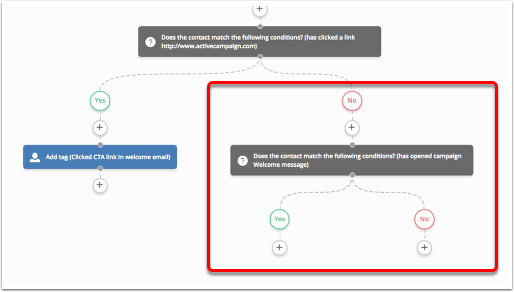 This way we can use the reply to gather data on our contact’s engagement as well as the efficacy of the campaign. Read more about Reply Tracking here. Click "Finish" at the top of the page. Now we need to plan ahead a little bit. I want to use an “If/Else” condition to divide the contacts going through this automation. If they opened the email, I want them to receive a tag that they opened it. If they clicked the link in the email, I want to tag them that way. And, if they didn’t open it or click a link, I want to tag them accordingly. But, I can’t just add the “If/Else” because it will send the email and then immediately check to see who opened and clicked. No one would even have time to open it! This is why “Wait” conditions are so useful. With them, you can give your contacts plenty of time to perform whatever your target behavior is before proceeding on with the automation. In this case, I am going to give contacts a week to get to the email, but, using a “Wait until…” condition, I’ll have the automation proceed when they’ve clicked the link. 1. 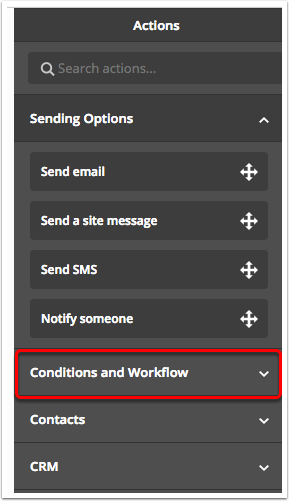 Click "Conditions and Workflow" located on the rightside menu. 2. Drag the "Wait" action and drop it below "Send email." You can also click the node (+) under the Send email action to add a wait step. For our purposes here, the “Wait… until specific conditions are met” option makes the most sense because we can proceed with the automation as soon as they’ve performed the target behavior. 4. After clicking “Wait until specific conditions are met,” you’ll be presented with the Conditions Editor which allows you to specify the conditions your contacts must match. 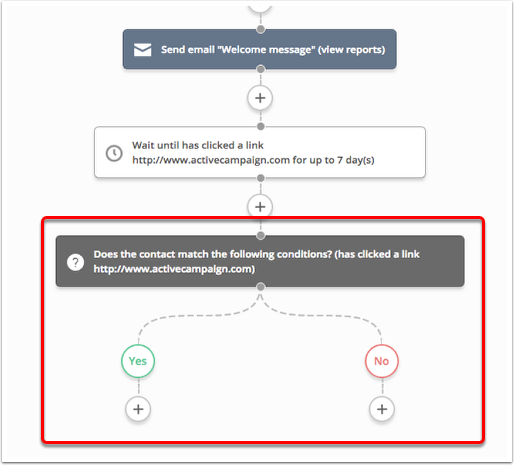 I am setting my conditions to “Actions > Has clicked on a link” in “Welcome email” and am selecting a link I used in my email. 5. You’ll now be asked to specify how long contacts should wait here if they haven’t clicked the link. Seven days should give them plenty of time to get to the email. If they haven’t in that time, my assumption is they probably aren’t very interested and the message has been pushed down so far in their inbox that they might never get to it. Click “No time limit” to display the “Up to” option, then click “Up to” and set the amount of time to wait, then click "Save." You are free to adjust that time up or down on the basis of what makes the most sense to you. 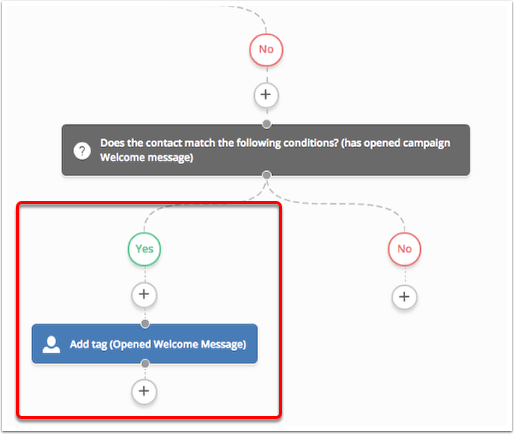 Now that we’ve given our contacts adequate time to interact with the message we’ve sent, let’s split them up, based on what they did and didn’t do, and apply tags that we can use to begin other automations, create segments, and for analytics. 1. Click the “+” button below the “wait” action to add an “If/Else” action or drag and drop it from the sidebar. 2. 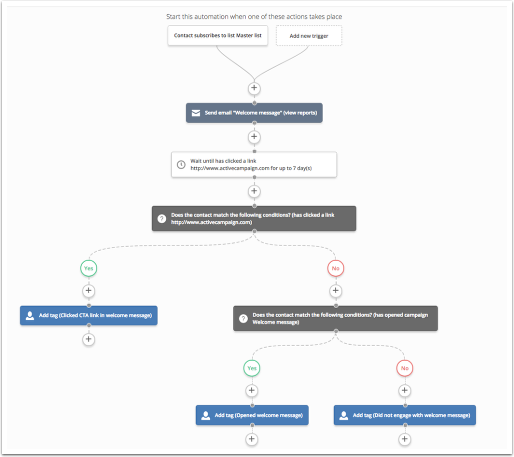 You’ll be presented with a modal window asking “How would you like to split this automation?” and you’ll be able to specify the conditions using the same interface we used to create the “Wait until…” conditions. 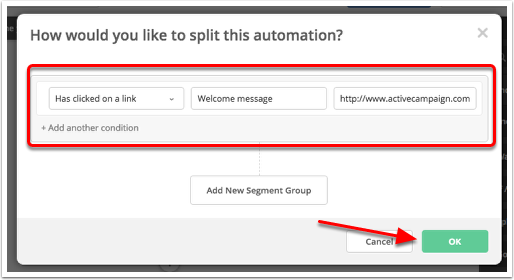 I set my conditions to “Actions > Has clicked on a link” in “Welcome message” and provided the link in the split action builder. Click “OK” to save the conditions. 3. Depending on whether your contact matches the conditions you set, they will proceed along the “Yes” or “No” path. 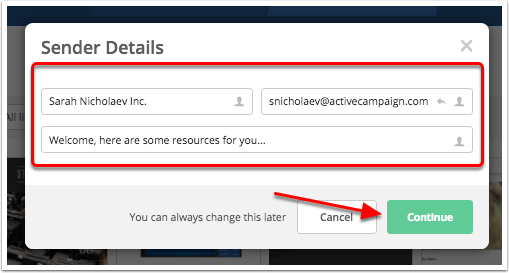 Under the “Yes” path, which will be the path followed by contacts who did click your call to action link, let’s add an action to “Add tag." To do so, click the “+” button or drag and drop the “Add tag” action to the “Yes” path. The tag you apply can be wordy and descriptive or short and cryptic. We recommend using a consistent naming convention for your tags and making a note of them in a spreadsheet so you avoid a situation where you can’t recall what a tag means or why you are using it. 7. The “No” condition will contain the contacts that didn’t open the email AND didn’t click the call to action link (because we’ve already separated those contacts out). 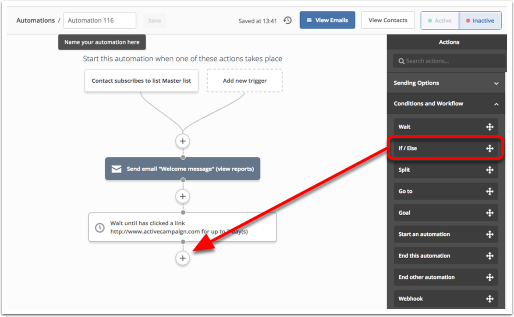 Now we have an automation that delivers a welcome email and/or opt-in incentive immediately after someone joins your list. Based on how our contacts interact with that email, we give them a tag. That tag can be used to begin other automations. 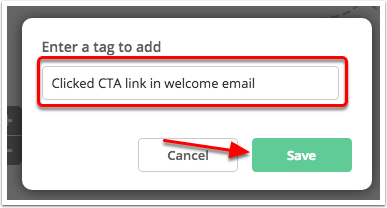 For instance, you could create an automation that begins when the “Clicked CTA link in welcome email” tag is added. 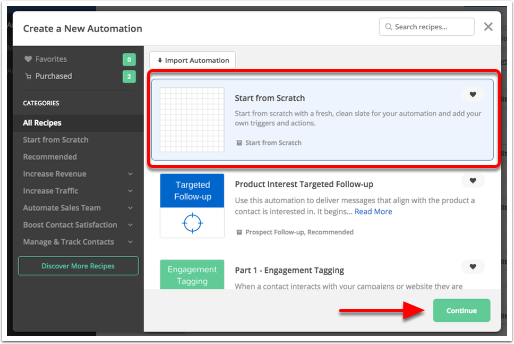 That automation could wait a certain amount of time and then, if they haven’t purchased yet or proceeded further down your funnel, you could send them a reminder email that uses a different angle to motivate them. 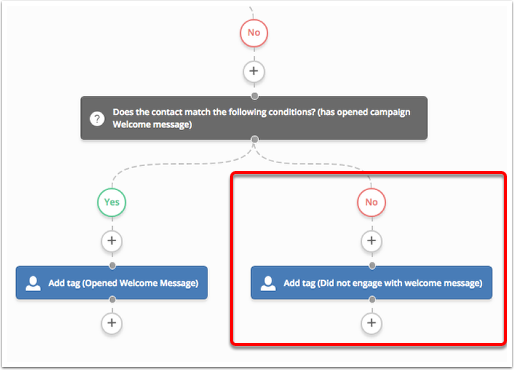 In this way, you can create automations that use data collected from other automations to create follow-up that adapts to your contacts behavior. 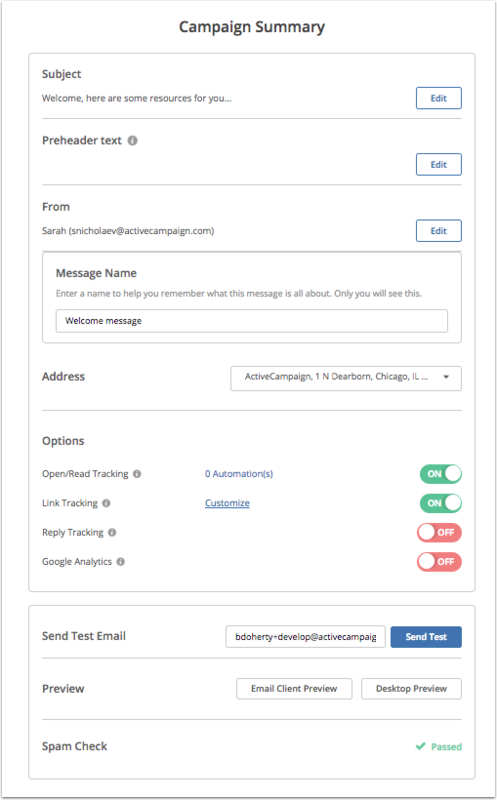 Add an action to increase your contact’s score as they interact with your messages. You could increase their contact or lead score if they open emails and click specific calls to action. Send different follow-up messages to the people who didn’t click the link and the people who didn’t open the email. This shouldn’t be the same content because you’ll annoy your contacts. You also shouldn’t follow-up endlessly until they do what you want. If you’ve given them 2-3 opportunities and they haven’t followed through, that’s a pretty clear indication that they aren’t interested and you’d be better off not contacting them instead of pestering them and accumulating SPAM complaints and low email interaction rates (which many ESPs factor into deliverability). How can I resend my campaign?